What happens to your business model if limitations are removed or flexibility added ? Listening to the now freely available audio version of Chris Andersons book “Free” I realized that this is not about whether you charge for your product or not, but has a far more fundamental implication for all owners of a business model. As Chris has outlined in his book there are many different ways to make money based on “Free”. The challenge for any business however is to pick one and before that start thinking about the business model. 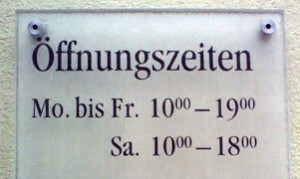 This reminds me of the time when the legislation of shop opening hours was changed in Germany from a very limited model (Monday through Friday, 7.00 to 18.30, Saturdays, 7.00 to 14.00) to an extended one (Monday to Saturday 6.00 to 20.00). With the previous hours it was possible to open the shop almost all the available time or at least there were the standard hours of 9.00 to 18.30. Now, suddenly shop owner were forced to make decisions. Should we open later so that it would be easier to close later? Does it make sense to open until the last possible time? When is actually the best time for our business? How to organize shifts in line with customer demand? Especially owners of small or mid-sized shops had to make decisions here and you could clearly see that they were not used to this kind of business (model) thinking. Now with “Free” as an option or competitive threat, the same kind of considerations are suddenly necessary, where previously the model was simple: you sell a product and the customer pays for it.